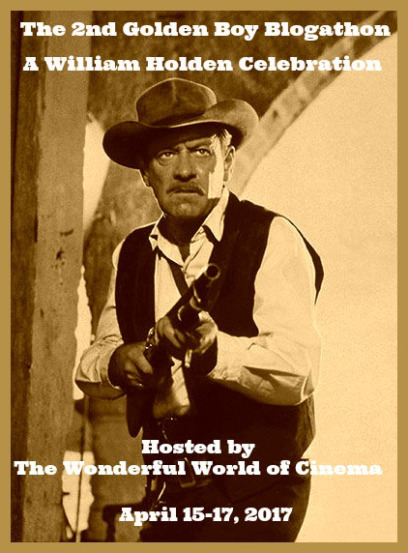 This is my entry for the (William Holden) Golden Boy Blogathon hosted by The Wonderful World of Cinema. My first introduction to William Holden, at least my earliest memory anyway, was as the star of the made for TV-version of the Joseph Wambaugh police novel The Blue Knight. I was only attracted to it because it was a TV movie of a book that I had thoroughly enjoyed. I had no idea at the time whom Holden was. I was entertained by the movie, and it was obviously a very good performance because Holden won the Emmy that year ( for Best Actor in a Limited Series). But by 1973, the year that NBC broadcast the made for TV movie, Holden had already had a career spanning several decades, having been nominated twice, at that point, (and winning once) for Oscars, and having had several memorable roles besides. At only 12 years old (in 1973), I had had very little experience with movies, and TV was my only window into the acting world. So, still on the horizon, for me, were the experience of such seeing bravura performances as Joe Gillis (Sunset Boulevard), Sgt. Sefton (Stalag 17), Cmmdr. Shears (The Bridge on the River Kwai), and Pike Bishop (The Wild Bunch), as well as his later Oscar nominated role as Max Schumacher in Network. Some of Holden's better roles are the ones for which he is lesser known, however. It was a tossup, therefore, as a choice for this blogathon that I picked one of the more obscure roles. It was going to be either the WWII adventure The Devil's Brigade (in which he co-starred with Cliff Robertson and Vince Edwards), or his turn as co-star with John Wayne in The Horse Soldiers. Since I can't resist a Duke entry, I chose the latter, but I may go the second route next year for the next "Golden Boy" entry, because it's a damn good movie in it's own right. William Holden plays Major Henry Kendall, a medical officer in the Union Army whose sense of his commitment to his profession is at odds with and often conflicts with that of his superior officer, Colonel John Marlowe (John Wayne). The movie is the 11th time that Ford and Wayne paired up, but it was the first time that either had appeared with William Holden. According to behind-the-scenes stories, the two were entirely different on the set. Wayne, always the outgoing and fan-friendly type would dig in with fans who showed up on the set, but Holden considered his paramount to everything. A recent article (an interview with co-star Constance Towers) in a piece written for True West Magazine by Henry C. Parke backs this up, as she claims he was shy and refused requests for autographs. Holden and Wayne, as Kendall and Marlowe, are often at loggerheads throughout the movie. Kendall as a doctor is committed to helping out any and all who need his help, this despite the fact that some of his patients are either enemy combatants or victims who, by his delaying the mission for his helping sometimes seems to jeopardize the mission, or even outright hurt his own safety if he is caught by the Confederates. The movie starts out with Marlowe being commanded to go deep into enemy territory to cause havoc with the enemy supply lines at a place called Newton Station, a supply depot near Vicksburg, Mississippi. Wayne finds himself saddled with Union doctor, Kendall. Marlowe does not want to be hampered by such things as wounded, and in fact expected to leave behind any wounded soldiers for the Confederates to capture. Of course, Marlowe does realize that Andersonville and other Confederate P.O.W. camps are not exactly havens of good P.O.W. relations, but he is rather single-minded in achieving his mission, despite any altruistic thoughts on the part of his subordinates. Kendall immediately gets on Marlowe's bad side when he leaves the troops to assist in the delivery of a baby in a nearby encampment of former slaves. Kendall is reprimanded and put under officer's arrest. Marlowe insists that Kendall's duty is to the army, not to civilians, which of course Kendall takes objection to, since he feels he is more committed to his Hippocratic Oath than to his Oath of allegiance to the Union. Later the Union troop commandeers the mansion home of a Southern Belle, Hannah Hunter (Constance Towers) and her maid/slave, Lukey (Althea Gibson). Through some trickery which is subsequently discovered, Hannah finds out about Marlowe's mission. As a result, he takes her hostage to prevent her from revealing to the Confederates his goal. Of course, this does not set well with the dainty woman, and she constantly tries to either get away or hamper Marlowe's movements. In war, all is fair, and Hannah constantly tries to renig on her agreement to not contact any Confederate soldiers, including one attempt where the Union troop tries to remain in hiding while a larger Confederate group of soldiers passes by. Eventually, Marlowe's despisal of Kendall comes out as Marlowe blames doctors in general for the death of his wife. Eventually both Hannah and Kendall come to respect Marlowe, and his mission. Kendall never loses his determination to do right by his Hippocratic Oath, and in the end determines to help the wounded in the face of odds that he will be captured by the Confederates. On one occasion the troop meets up with a wounded friend of Kendall's, albeit one who has sided with the opposing force and is now a prisoner, Col. Miles (Carleton Young). Such was the story of brother against brother (and friend against friend) that was the basic sad tale of this point of American history, that even though the two are on opposite sides, their friendship still remains solid. In fact, even when Miles tries to lead a charge, Kendall knocks his friend to the ground to prevent him from being killed and later attends to his wounds. Holden is the more sympathetic character of the duo, Wayne being typically Wayne, determined to do the duty for which he has committed himself despite any conflicts that may try to deter him. I find Holden to be the consummate rendition of an idealist, determined to stay the course to his doctor-hood despite the conflicts that occur between him and Wayne. It's too bad the two never paired up again, because the chemistry works on all levels. Hope you folks have a good Easter weekend. Enjoy the celebrations. The Horse Soldiers has grown on me over time. Not a classic, but even when his heart was no longer in the project, Ford can't help but do a professional job. Like you, I do wish Wayne and Holden had appeared in another film. They made a very interesting team. Some of the better Wayne movies involved pairing with contemporaries. Although I find this one a little dragging at times, it is a pleasant way to spend a couple of hours. If you haven't seen it, I highly recommend the Wayne-Kirk Douglas venture "The War Wagon" which I intend to review soon. Thanks for reading. I'll look forward to your War Wagon review. That is one that seems to get better as it or I age. Horse Soldiers was my intro to William Holden, and I still love this movie. Although, mostly, I just wait and wait for the end of the movie and the Holden/Wayne fight, which is always over before it really has a chance to get going, sigh. That and when Holden gets to work on the wounded Wayne. Hah. 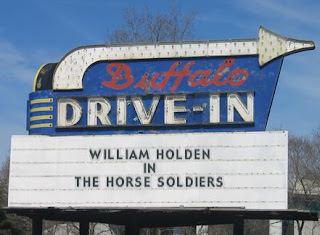 Enjoyed reading your thoughts on this movie and Holden. Glad to see your input. I hope you come back more often. Thanks for reading. A happy Easter to you too! I've heard and read about this film but I still have to see it! The Wayne-Holden's team sounds quite interesting. That was a great review and I love your introduction where you explains to us how you discovered our Golden Boy! My intoduction to a lot of great actors came as a result of watching TV in the 70's. I spent more time watching movies then, because even then I didn't like TV shows as much as I did movies. Thanks for reading. This film was an enjoyable one. Indeed, Holden and Wayne are perfect opposites, and it's curious to know they behaved like opposites even when cameras weren't rolling. I have a long list of Wayne movies I need to review, and it was great to have an excuse to include this one. I'm putting several on the menu over the next few months, including one with Dean Martin in June. I need the excuse to finally get around to reviewing Wayne movies, and these pairings give me the inspiration to follow through. Thanks for reading. This is probably the second thing I saw Holden in -- my first was an ep of "I Love Lucy." I have only seen this three or maybe four times, but I definitely enjoy the way Holden and Wayne interact. Like you, I wish they had made more films together. I only just this week finally got around to watching it the first time, myself. I have so many movies its hard to find time to motivate myself without blogathons. Thanks for reading. I grew up watching the John Ford cavalry films so I'm surprised I haven't seen this one. From your article The Horse Soldiers sounds like what Sam Peckinpah was aiming for with Major Dundee. With Ford's veteran control of the production he was able to actually execute it and not have it taken over and mangled by the studio. P.S. 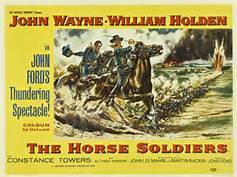 Isn't the theme song for The Horse Soldiers catchy?